I want to know if you have a second hand HP DesignJet 500 plotter to sell? Sorry, Cartridge Save only supplies the Designjet 500 ink and consumables and we don't actually sell the printers themselves. How much is the cost of an A1 size drawing in black and white print using HP Designjet 500 ink cartridges? Please could you tell me what your cost-per-copy basis is - e.g. is it an average based on A0 / A1 / A2 sized paper? We base our page yields on a 5% coverage of an A4 page. Please can you confirm the information about returning cartridges? You can return any faulty item(s) received for a refund or replacement. Items ordered in error by the customer can be returned (at customers own cost) for a full refund only if they are in a fully unopened and saleable condition. You must obtain a returns reference before returning any items. If you require further assistance please contact our customer care team using our freephone number. How much ink is there left in your HP 500 cartridges? After some time your HP 500 will run out of printer ink, and when it does you'll discover that buying HP 500 ink may be an expensive affair. But you have no need to waste time worrying about paying the steep prices you'll uncover on the high street because now at Cartridge Save you can order all the HP 500 cartridges you will ever need at really competitive prices. Start to save money on your ink by buying online at Cartridge Save! Why pay high prices for the 500 original cartridge or 500 compatible ink down the main street when it is far more straight forward to save a bundle of money buying with Cartridge Save. You have total peace of mind by ordering your Designjet 500 ink cartridges from us because each one is covered by a rock solid money back guarantee. Be mindful of the fact that every order comes with free delivery, typically arriving at your door the very next business day! The HP Designjet 500 is an entry level large format printer suitable for mechanical design, engineering, and architectural printing. It boasts resource-saving features such as low-cost operation and 'unattended' printing mode. The HP Designjet 500 roll printer is easy to operate and install, but does not offer networking connectivity. Weighing 99.2 lbs, the HP Designjet 500 has dimensions of 67 x 27 x 23 inches. This colour printer has a maximum resolution of 1200 x 600 dpi. Print speed goes as fast as 85 sq.m/hr for colour draft. The HP Designjet 500 inkjet printer can handle a wide range of media, from translucent bond paper to canvas and banners, and supports single sheet feed, roll feed, and automatic cutter. For connectivity, a USB port and a parallel port are available. The HP Designjet 500 colour inkjet printer is compatible with Windows operating systems and accepts print language Adobe PostScript. The Designjet 500 printer is reasonably-priced and delivers high-quality results on a consistent basis. Networking is not supported by the HP Designjet 500. It does not have Wi-Fi or Ethernet and only uses parallel and USB ports. The HP 500 Designjet printer is very bulky. Users should also expect the inks and printhead replacements to be quite expensive. 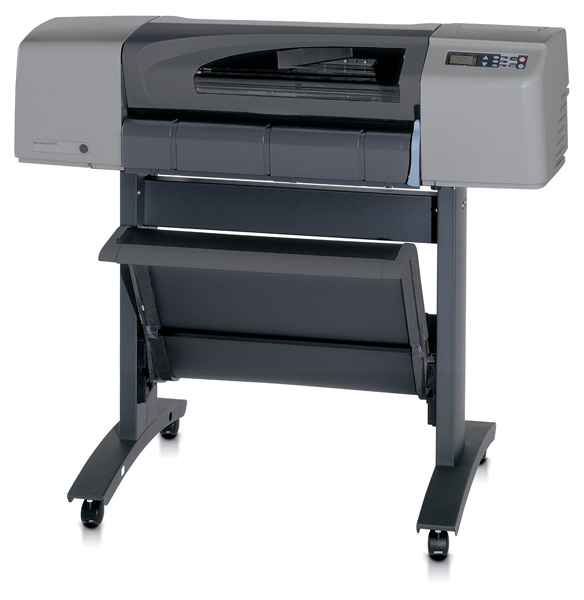 Also, the HP Designjet 500 is mainly available in Latin America and Spanish countries.